Texas Tea Party candidates lose big: John Cornyn and Pete Sessions win easily. How the Texas Tea Party became nothing more than an effort to take people’s money. 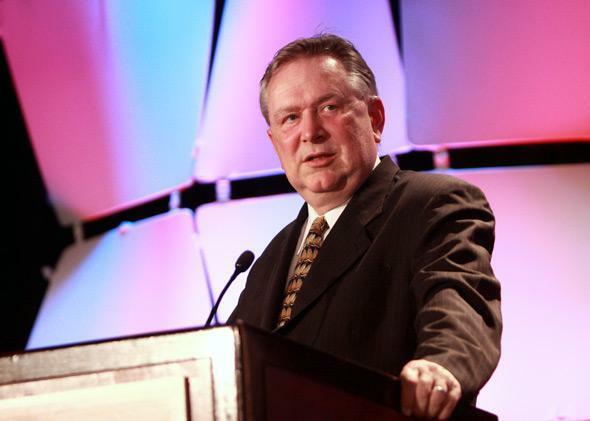 Steve Stockman speaks at the Liberty Political Action Conference in Chantilly, Va., on Sept. 20, 2013. The headlines are as lousy as anyone could dream up. From the Associated Press: “Republican Cornyn Wins Primary in Texas Over Tea Party Foe.” From Politico: “Two Pillars of the Republican Establishment Crushed Their Tea Party–Inspired Primary Challengers in Texas.” Hadn’t it just been a few days since the movement gathered in Washington and celebrated for its five-year jubilee? Hadn’t Sen. Ted Cruz said they were winning? What happened? Nothing happened. That was the point. Neither Sen. John Cornyn nor Rep. Pete Sessions was ever at risk of losing his primary. The organizations and people that claimed these establishment Republicans were in danger inspired headlines, trend stories, TV buzz—fundraising. They followed that up by expending exactly zero effort. Tea Partiers and other conservatives did quite well down the ballot. On Wednesday morning, a Texas Tea Party organizer copied me on a memo about the votes in “major races,” like lieutenant governor and attorney general and various state legislative districts. He didn’t mention Cornyn’s campaign against Rep. Steve Stockman, or Sessions’ 2–1 landslide over Katrina Pierson. You could describe the choice for activists as one between the scoreboard and the school board, between “challenging” the leaders of the GOP in a way the press can cover and changing the GOP with unsexy local election wins. Tuesday was an apocalypse for the team scoreboard. Stockman, who lost to Cornyn by 40 points, keeps getting eulogized as a “Tea Partier.” That was never true. Stockman won an upset in 1994, the first modern Republican wave year, and lost in 1996, making such a buffoon of himself in the interim that future Republican leaders would cite him as a cautionary tale. He returned in 2012, running as “Congressman Stockman,” a title he hadn’t held since Bill Clinton’s first term. But his tactics never changed. Republican voters found “conservative newspapers” in their mail, loaded with negative stories about Stockman’s opponent, yet mysteriously bereft of bylines or sources or anything about Stockman’s own inscrutable finances. Stockman didn’t run a Senate campaign. He ran a kamikaze mission with no fuel, map, or targets. He lied relentlessly, often through a Twitter account ghost-written by his spokesman and always in a manner that could be debunked with a quick phone call or Googling. Stockman claimed to have won “Tea Party straw polls” that were held months earlier. His campaign sites (which accepted bitcoin donations, naturally) featured a chintzy Photoshop that made it look like Cornyn had hugged Obama, and a list of “past and present endorsements,” one of them from an activist who’d been dead for most of 2013. Days before the election, Stockman claimed an endorsement from “the head of one of the biggest Tea Party groups in America.” Jenny Beth Martin, the head of Tea Party Patriots, had not endorsed him. She’d given a nice quote about him to WND—in December. Actually, if you’d been following Stockman’s race on WND, Tuesday’s result would have stunned you. The conservative news site reported that Stockman was following a “Cruz missile” strategy and closing the gap with Cornyn, citing one Human Events/Gravis poll that ended up missing the result by 25 points. Jerome Corsi, the author of the investigative journalism classic Where’s the Birth Certificate?, endorsed Stockman and wrote credulous WND columns about his race. Stockman had blown off Texas reporters and made no public campaign appearances since January. He gave Corsi an exclusive interview. The broader right has an uneasy relationship with Corsi and WND. It’s not just that the site obsessively covered conspiracies about President Obama’s citizenship or that it bought billboards to advance the conspiracies. It’s that the site twins conservative news with get-rich-quick, survive-the-apocalypse, buy-buy-buy ad scams. Eric Hoffer’s theory that every political cause becomes a “business, then eventually degenerates into a racket,” is proved every day at WND. It’s proved in less noticeable ways on the email lists of defeated presidential candidates like Herman Cain that have been sold to quacks. Stockman was a uniquely incompetent scammer, but he didn’t have the field to himself. The danger of “scoreboard” politics, of choosing big targets, is that you’ll likely lose. The upside is that you’ll definitely raise money. The Stockman race was a cruder, less ethical version of the Tea Party Leadership Fund’s promise to “Defeat Boehner.” Sure, the speaker of the House is even safer than Cornyn, but the Tea Party Leadership Fund has raised millions and kicked back most of it to consultants. According to the Federal Election Commission’s records of independent expenditure, FreedomWorks spent no money on Pierson’s race. In the last week, the Conservative Campaign Committee spent around $16,000. The Tea Party Patriots Citizens Fund spent around $5,000, having endorsed Pierson officially on Monday—the day before the primary. But FreedomWorks spent elsewhere. I asked what the group had done in Texas’s primaries and got no response. If you’d been following FreedomWorks’s claims about Texas, this didn’t make much sense. The group had bet heavily on Cruz’s 2012 primary campaign, sending its then-director of campaigns, Brendan Steinhauser, down to Texas to organize events. In July 2012, FreedomWorks brought 14,000 conservative activists to Dallas for a “FreePAC” rally in support of Cruz. In June, after former Obama campaign strategists started a voter registration program called Battleground Texas, FreedomWorks announced an agenda named for the flag of the Battle of Gonzales: “Come and Take It.” Politico obtained the full plan, which asked for $7.95 million to blanket Texas in ads and full-time canvassers. The number was eye-popping—and fanciful. A few months after the “Come and Take It” announcement, FreedomWorks revealed that it had raised $40 million in 2012. BuzzFeed’s Rosie Gray reported that less than $10 million had come in through 2013. FreedomWorks didn’t deny this. Its spokeswoman cautioned that the group worked on a two-year fundraising cycle. That was a pointless distraction. Cornyn’s campaign wasn’t hurt in the slightest. His victory, and Sessions’ victory, will end up convincing plenty of reporters that the GOP establishment has finally conquered the right. The outside groups that overpromised in Texas will raise money by promising to take better scalps in other races. The racket only stops when the checks stop.